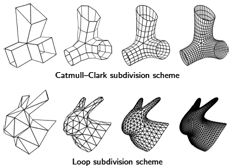 In recent years, geometry processing algorithms that directly operate on polygonal meshes have become an indispensable tool in computer graphics, CAD/CAM applications, numerical simulations, and medical imaging. Because the demand for people that are specialized in these techniques increases steadily the topic is finding its way into the standard curricula of related lectures on computer graphics and geometric modeling and is often the subject of seminars and presentations. In this article we suggest a toolbox to educators who are planning to set up a lecture or talk about geometry processing for a specific audience. For this we propose a set of teaching blocks, each of which covers a specific subtopic. These teaching blocks can be assembled so as to fit different occasions like lectures, courses, seminars and talks and different audiences like students and industrial practitioners. We also provide examples that can be used to deepen the subject matter and give references to the most relevant work.